If you had to design the world’s best Business Class lounge, what would it look like? Aside from a bouncy castle, ball pool and wave machine, chances are it would look something like the Turkish Airlines CIP Lounge at Istanbul Atatürk Airport. The vast two-storey lounge complex comprises copious amounts of gourmet dining stations, luggage lock ups, plush sofas, round-the-clock TV news feeds and sweeping views over the outside of the airport. Sample Turkish dishes, take a shower, unwind with a massage or simply relax, the lounge has an abundance of options. Expect to find video games, snooker tables, golf simulator, a Scalextric track that’s modelled on Istanbul itself, and a cinema to keep you occupied. It’s essentially a wonderland for work, rest and play. If you need Wi-Fi access (and who doesn’t?) it’s simply a case of scanning your card and printing off a unique password. Hey presto, you’re online and able to catch up on emails, YouTube, Netflix and more. On board there’s plenty of room, despite the daunting 2x3x2 seating configuration. In fact, I found myself dead centre in the three-seater configuration, but since I was anticipating a long and deep sleep, I wasn’t particularly phased. SeatGuru has the seats listed as 22-inches wide and the experience was soft and comfortable, with privacy dividers available to blinker the experience if you’re adjacent to strangers (or friends and family you’re happy to zone out from for a while). WiFi is provided free of charge for Business Class passengers with ultra-easy access but at speeds that don’t afford you a typical online experience – but literally no airline is quite there yet. However, it’s sufficient for WhatsApping and Instagram browsing, or even some work if you’re really that dedicated. A nice touch is the Turkish Airlines Business Class ottoman storage, which provides ample space to stash shoes and other essentials in your foot rest, de-cluttering your seating area and saving constant access to your overhead storage. The cuisine is another highlight with a “candle-lit” dining experience (expect battery-powered flickering candles), which provides warm breads and oils while you wait for your generous portions of on-board cuisine. For those who eat red meat, the lamb chops are unlike anything you’ll have ever tasted on a flight, but fear not, there are numerous options that include seafood, white meats and veggie pastas, along with dishes for specialist dietary requirements, provided you’ve pre-booked. Since you’re cosy enough to nap away the flight, you might even bypass the entertainment options, but you’d be missing out. The airline has enhanced the selection of media available on its inflight entertainment system by adding the latest media content. There is something for all tastes and you will find yourself enjoying the journey even more with the best in entertaining films, music, games, and other new media content. Turkish Airlines has also partnered with Universal Music Group to create a special inflight music platform, My Music Planet. The music collection features over 750,000 songs from over 3,500 musicians as well as live concerts and backstage footage. Aside from featuring a number of cinematic releases straight out of the cinema, the entertainment system is also suitable for kids, with a range of films, TV shows, and games, specially chosen for young passengers, thanks to other partnerships with Disney and other film companies. 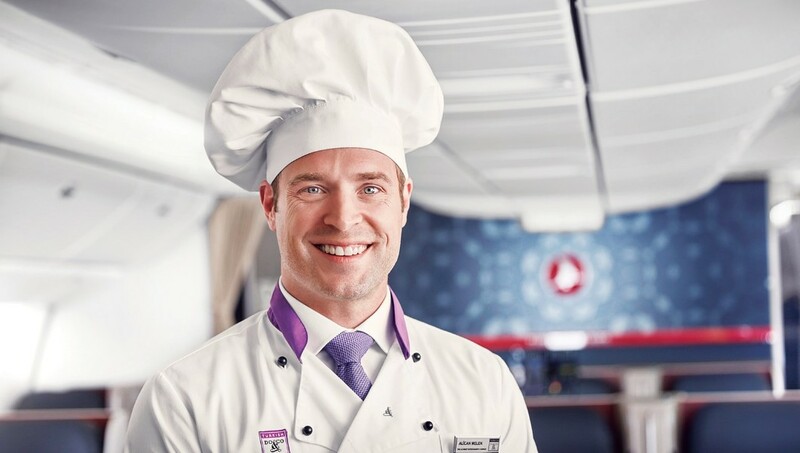 Above and below: the Turkish flag carrier has also revealed the new cabin crew uniforms, which arrive in time for the new Istanbul airport, due to open its runways in March this year.